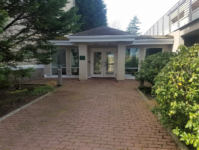 Family Support Center of South Sound is a nonprofit 501c3 multi-service agency located in Olympia, Washington, founded in 1992 to provide families and survivors of violence with coordinated, supportive services in one centralized location. You can learn more about our programs and services here. Our Mission - "Working Together to Strengthen All Families"
Our Vision - We envision a community where all families are valued, nurtured, and have the resources to be strong, healthy, and self sufficient. We have moved! We are now located at 3545 7th Ave SW, Olympia, WA 98502. Family Support Center offices are on floors 2 & 3 of the tallest building on the left side of the complex. We are open Monday - Friday from 9:00 AM - 5:00 PM. The Family Resources Services Program has walk-in openings Tuesday and Thursday from 10:00 AM - 3:00 PM. If you have any questions please call 360-754-9297. Joining us in our new buildings include many friends who have like-minded missions that compliment our work. We warmly welcome: United Way of Thurston County, Catholic Community Services (SSVF, Volunteer Chores, and Bus Buddy programs), Thurston County Volunteer Legal Services, Thurston County Prosecutors Office- Felony and Misdemeanor Domestic Violence Teams, Crime Victim Advocacy Network, Junior League of Olympia, Innovations Human Trafficking Collaborative, Enriching Therapy, Beautiful Instant Psychotherapy and Wellness, Thurston County Clerk's Office, Thurston County Sheriffs Department, Adult Protective Services. April 11, 2019 – 100 Women Who Care About Kids: Together, in ONE HOUR, you can help to raise $10,000 to better the lives of children in our community. Sign Up TODAY! May 12, 2019 – 5th Annual Mother’s Day 5k and Kids 1 Mile Run: A fun, family friendly 5K over a USA Track & Field certified course! Register TODAY! June 8, 2019 – Family Support Center’s Birthday Bash! : Join us as we celebrate Family Support Center’s 27 years of service to the community and Pear Blossom Place’s 5th Anniversary. Early October, 2019 – 100 Men Who Care About Domestic Violence: Gather with men from across the region and stand up to end domestic violence in our community. October 29, 2019 – Family Support Center's Annual Fall Breakfast: We hope you will join us in celebrating our successes and honoring our supporters and all of the families we serve. Save your seat for Family Support Center's Annual Fall Breakfast Today! Click here to find out more about Family Support Center's Events! CAMP HOPE America-washington - Counselors wanted! Are you 18-24? Are you passionate about children? Do you have endless energy and the ability to inspire others? We want you to join us at Camp HOPE America-Washington! We are seeking volunteer counselors for the weeks of July 1-6, 2019. Counselors will be required to attend a sixteen hour training prior to attending camp. Find out more about Camp here. APPLY NOW TO BE A CAMP COUNSELOR. We prepare all of the meals, snacks, and treats for Camp HOPE on-site. We are looking for individuals or groups who would like to volunteer in the kitchen to help our fabulous Camp Cook during the week. If you would like to volunteer, please complete this application. Thank you!